Finding print magazine sales leads to pitch your story ideas is one of the cornerstones to getting your work published. After all, if you can’t find outlets for your stories you won’t get published. This has always been a simple, straightforward, and enjoyable process for me. I love wading through magazine racks at my local Barnes & Noble and newsagents and consulting my well-thumbed Writer’s Market. And I enjoy doing an online search for magazines in the genres that I write about. I never stop looking for fresh magazine leads, so I was delighted when a new travel writer that I’m coaching told me about a useful online resource for magazine and newspaper leads. When I took a look at it, I was impressed with what I found, and I think you’ll find it useful, too. This website, called EasyMediaList (www.easymedialist.com), offers comprehensive lists of magazines, newspapers (and radio and TV stations). Its biggest asset for travel writers is its National Magazine Media Lists, by topic. And yes, hallelujah, there is a ‘Travel’ section here, which contains 126 travel magazines! What I really like about EasyMediaList is that you can pick and choose the magazine titles you want by checking a box. You can bypass the ones that do not apply to the particular story or region you’re working on. And you can un-check the ones already on your list. When you choose a magazine title on EasyMediaList.com, you get contact details as indicated in their list - things like the editor’s name, email address, the magazine’s general telephone number, and mailing address. The website offers media / magazine sales leads for major U.S. cities in all fifty states. So if you’re planning a trip to another city or state in the U.S., EasyMediaList can help you find potential magazines and newspapers there that might go for your stories. One thing to bear in mind is that many regional magazines prefer to work only with residents of their own states. So don’t be surprised if some of these magazines reject your pitches for this reason. This has happened to me numerous times. But, don’t let this deter you. You should still pitch your stories to any and all regional and state magazines where you think your article would be a good fit. Sometimes you’ll make a sale. There are a few limitations to EasyMediaList. EasyMediaList only offers U.S. outlets. This means you’ll still have to come up with your own sales leads for international magazines and newspapers. So don’t throw away your Writer’s Market, and do continue to scan the magazine racks at your local bookstore. By far, the biggest downside for freelancers is the price. At approximately $1 per item, putting together your magazine list can get pricey fast. Is $1/item reasonable value? Having gone through the process of creating multiple distribution lists, I believe it’s very fair. 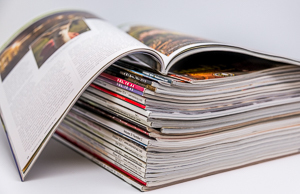 It takes a lot of time to hunt down magazine titles, research the publications, and collect contact details. Given the amount of time that goes into putting together lists of magazine sales leads, I’m sure I would have used this website when I first started my travel writing career had I known about it. However, there is far better value out there if you are prepared take some time and hunt around. I mentioned several other online magazine databases in my article about creating your own distribution lists. But, I’m still delighted to find this new resource. If you use it wisely, it’s a great resource. I already have my own list of 100+ print magazines to use as a foundation. I’ll sort through EasyMediaList for relevant magazines that aren’t on my list, and add the ones that look like good leads. Probably I’ll wait until I have a specific article in mind. Then I’ll check EasyMediaList for potential sales leads not already on my list. Once I have the contact details, I will still need to find the writer’s guidelines for each publication, but then I’m good to go. 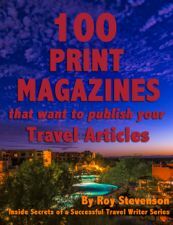 If you’ve already purchased my book, 100 Print Magazines That Want To Publish Your Travel Articles, you can do the same thing. Use the magazine sales leads in this book as your foundation magazine list, and then add to it using EasyMediaList or any other available resources. When you put together your magazine lists from a variety of sources, you’ll be creating a very robust reference for yourself that will help you quickly identify magazine sales leads when you’re ready to pitch an article. international publications, plus an assortment of travel magazine sub-genres. nine pages of solid, actionable coaching information about pitching your stories to specialty magazines. This ‘how to’ section covers using writer’s guidelines, the querying process, submitting your stories to magazines, and the thorny issues of simultaneous submissions. you’ll get more than just contact details. All of the listings have an introductory paragraph or two (with some much longer) giving you insight into the magazine and its general editorial thrust. In many cases I provide my personal insights into working with the editors of the magazines that have published my travel stories. You get the inside scoop from me! links to the magazine’s writer’s guidelines, saving you time and effort. Once you have a foundation list like the one found in 100 Print Magazines That Want To Publish Your Travel Articles, you can supplement your list with additional leads from EasyMediaList and many other resources you find online.